Black Hand as he appears on the cover of Green Lantern vol. 5 #11 (July 2012). Previously: Absorbs lifeforce energy from living creatures to recreate his destroyed hand. Created and wields a device which siphons energy from green power rings and mimics their abilities. Black Hand first appeared in Green Lantern (vol. 2) #29 (June 1964) and was created by John Broome and Gil Kane. The character's name is a tribute to DC writer and Batman co-creator Bill Finger, on whom the character was based. In preparation for an inevitable battle with the Coast City-based Green Lantern (Hal Jordan), Hand makes his most noteworthy invention. The device he creates is able to absorb the residue of a Green Lantern power ring's energy from any object that it touches. Once fueled by this energy, his device can then be used much the same way as a Green Lantern ring. In one crime spree, he uses his device to persuade the general public the items he has stolen have, in fact, never been touched. Hand also tends to break the fourth wall, speaking directly to the reader about his plans to confront Hal Jordan. For a while, he retires from a life of crime and attempts to run an adult theatre. This new lease on life is ended abruptly by Guy Gardner and his girlfriend Ice. Black Hand develops a phobia of super-heroes. While trying to reorganize his life into more peaceful pursuits, he encounters Justice League members at the World Trade Center restaurant and has a mental breakdown. He is seen in the Infinite Crisis mini-series as a member of Alexander Luthor, Jr.'s Secret Society of Super Villains and one of several heroes and villains observed by Kal-L and Superboy-Prime. As part of his newly written background, his energy-absorbing weapon is now portrayed as being built by Atrocitus, a fervent enemy of the Guardians of the Universe. Atrocitus comes to Earth looking for the being who will coordinate the events that come to be known as the Blackest Night; that being is revealed to be William Hand. Atrocitus locates and attacks Hand, believing the black power literally lies within his body. Atrocitus is stopped by Green Lanterns Hal Jordan and Sinestro, while Hand (encouraged by a strange voice) pockets the weapon and flees the scene. He is later seen breaking into a hospital morgue, trying to steal one of the corpses there. When he is confronted by a security guard, he uses the weapon to kill him, after which saying to himself, the dead was good. The mysterious voice that tells Hand to steal Atrocitus' weapon for himself traps him under its thrall and influences him into resenting the Green Lanterns. As beacons of light, they upset the perfect balance of darkness and death. Trying to extinguish the light of willpower but unwilling to fight Green Lantern as an "average joe", Hand sews himself a costume using a family cadaver pouch and begins calling himself "Black Hand". Jordan apparently never connects William and his energy-absorbing weapon to his earlier fight with Atrocitus (believing it to be an original creation). Never revealing his weapon's true origin, Black Hand continues to fight him over the years, always retreating to a desecrated grave after each failure. There, he lies with the corpses, hoping for peace and release. While being transported to prison, Black Hand experienced a sudden power surge that killed his guards and began having visions of the dead planet Ryut and the Black Power Battery. 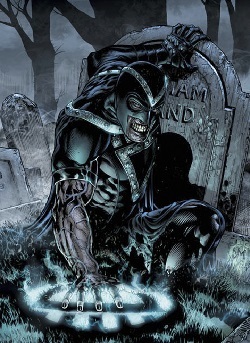 When Barry Allen attempts to attack Nekron, Black Hand steps in, using Batman's skull as an "emotional tether" to weaken the heroes, inspiring such an intense emotional reaction that Nekron is able to release a new wave of black rings to 'recruit' the resurrected, such as Superman, Wonder Woman and Green Arrow; Jordan and Allen only just escape the same fate when Allen takes them both two seconds into the future to disrupt the rings' connection to them The Black Lantern Corps are ultimately defeated when the White Entity is used to convert several Black Lanterns into White Lanterns before bringing Black Hand back to life when a white ring attaches to him, reviving him and forcing him to regurgitate several white rings, freeing the Anti-Monitor and destroying Nekron's physical form due to Hand serving as Nekron's tether to this plane of existence. He is later seen held in captivity by the Indigo Tribe, chained to the tribe's trademark power staff. From Blackest Night #2, a back-up feature entitled "The Book of the Black: The Burned-In Thoughts of William Hand" is shown, chronicling Black Hand's childhood memories, and his own personal opinions regarding each of the seven colors of the Emotional spectrum. In the end, his thoughts of the Indigo Tribe turn out to be a scream after his capture, hoping to be released from the Tribe's captivity; but much of the text is in the Tribe's language, thereby remaining indecipherable, except for a few names and four translated phrases. Black Hand confronted the currently-imprisoned Hal Jordan on the Indigo Tribe homeworld, the Tribe having abducted Hal and Sinestro, now a Green Lantern once again, with the intention of converting Sinestro into one of the tribe. With his ring depowered, Hal tricked Black Hand into manifesting the green energy of willpower and using him as a battery to recharge Hal's ring; however, the charge was still limited compared to what the ring would have been capable of if recharged normally. Black Hand is freed when guardian Natromo destroys the Indigo Central Power Battery. When the battery is restored, Black Hand's indigo ring tries to reach him; however, Black Hand kills himself rather than return to the Indigo Tribe. A Black Power Ring later emerges from his corpse, reviving him as a Black Lantern. Following his reanimation, he returns to Earth and murders everyone in a Chinese food restaurant and then raises his family from the dead to "have dinner" with him. He lays out his plan to kill and reanimate as many people as possible, reanimating his victims as undead murderers. Meanwhile, Sinestro takes Hal Jordan to the Book of the Black to reveal the plan of the Guardians of the Universe to replace the Green Lanterns Corps; however, as he opens the Book, Sinestro and Hal Jordan are sucked into it and drawn to Black Hand. Although Hal and Sinestro are able to destroy Black Hand's makeshift army of reanimated corpses by detonating Sinestro's old yellow power battery, they are unaware that Black Hand has witnessed a new prophecy in the Book of the Black: Hal Jordan will become the greatest Black Lantern. After trying to reanimate Hal's father, Black Hand is on the verge of being defeated by both Hal Jordan and Sinestro. The Guardians intervene, charging him up - which apparently grants him enough power to kill both his adversaries - before teleporting him in the Chamber of Shadows for unknown purposes "until he is needed". When Black Hand was imprisoned in the Chamber of Shadows, he reanimated the elder Oan (who was killed by the Guardians) for information about where the Guardians have put him in, but is only told that the First Lantern is a danger for the universe. Later, Green Lanterns Simon Baz and B'dg are sucked into the Book of Black and drawn to Black Hand. When they began battling Black Hand, he sends Simon to the Dead Zone where Hal and Sinestro are trapped. Green Lantern B'dg and the elder Oans subdue him to use his black ring to open a door to the Dead Zone in order to rescue Simon, but Sinestro unintentionally went with him, while Black Hand has vanished into the Dead Zone. Hal soon makes the ultimate sacrifice by killing himself in order to harness the power of the black ring to escape the Dead Zone and stop the First Lantern Volthoom. When the power ring turns Hal into a Black Lantern, Black Hand's body disintegrates into dust. Some time later, a black ring was able to revive Black Hand back on Earth once again, albeit in a slightly vulnerable state. Yet with the heroes of the world missing or dead, Black Hand wandered through the city as it is engulfed in riots, raising up dead people as zombies. Blaming Hal Jordan for all that happened to him, he finally makes his vendetta against the Green Lantern a lot more personal as he goes to the place where Hal's father, Martin Jordan, is buried and raises him and all the corpses in the cemetery. Black Hand removes one of his own hands and takes one of Martin's hand in its place, hoping to kill Hal Jordan with his father's own hand. Following the Forever Evil storyline, Black Hand raises a dead circus and raises the dead crowds to watch the stunt performers die. Hal Jordan interferes, but is not here to fight him and asks to ally themselves against the New Gods of New Genesis. Hal Jordan explains that New Genesis has stolen the entire Power rings for a weapon as the Life Equation for their pursuit. Black Hand agrees to aid him and sends the dead people to return to their graves. In the battle, Black Hand unleashes the spirits of the fallen Green Lanterns to the ensuing battle against the New Genesis soldiers that occurs near the Source Wall. Black Hand stops the battle as the New Genesis soldiers surrounded them. He smirks to see the Source Wall was a mass grave. Black Hand reanimates the grave of the Source Wall to attack the New Genesis soldiers. Black Hand then enters the Boom Tube to invade New Genesis' homeworld. Suddenly, Black Hand's powers were being effected with the horde of the Source Wall that are being subsequently resurrected by the leader of New Genesis, Highfather, and his misuse of the Life Equation and his arms were being turned to stone. He blames Hal for his plight and fled to deep space via the Boom Tube. In the aftermath, Black Hand was unable to raise the dead due to effects of the Source Wall. Black Hand arrives on an alien planet, turning everything he touched to stone. Black Hand becomes lonely when Hal arrives to confront him but Black Hand still blaming Hal for his plight, attacks the rogue Green Lantern, however using his power Gauntlet, Hal manages to defeat him as Black Hand's stone touch is ineffective against it. Hal returns to the Source Wall with Black Hand and asks Relic, who had been studying the Source Wall, to find a way to undo Black Hand's power effects from the Source Wall. Relic reveals that there is something outward of the Source Wall that it can consume of any stone material to return to its origin. When Black Hand is awake and attacks them, but he is getting hit back with a huge grappling hook sending him to the Source Wall by Hal's colleagues on the spaceship. Black Hand is not through, but the Source Wall dragged him to it and he tried to reach out as the Source Wall consumes Black Hand. Black Hand was apparently released from the Source Wall when the later was broken as he was seen back on Earth and built the Dark Church of the Black Hand, a cult that worships Death. They began kidnapping children in Opal City which eventually drew the attention of the Flash. Barry would track the cult just in time to prevent them from summoning Nekron by sacrificing one of the missing kids. He then easily defeated and delivered Black Hand to Iron Heights. Black Hand possesses a device that can manipulate the energy of Green Lantern power rings. It can obtain this energy by directly draining it from a ring or through the residue a power ring gives off. Like power rings, however, the device needs to replenish its energy on a regular basis in order to operate. Hand usually recharges his device during battles with Green Lanterns and has been shown to use it in order to help him locate nearby power rings. The device was recently revealed as being Atrocitus' creation, though it was previously assumed that he invented it himself. In Secret Origin, this device was quoted as being a cosmic divining rod, designed by Atrocitus to locate William Hand and defend himself against Green Lantern interference. After his suicide, Black Hand is reanimated by Scar when she releases the first Black power ring, making him the first Black Lantern. Reanimated by the ring, the head injury he inflicts upon himself during his suicide is erased, restoring his body to a working state. When the first Black power rings choose wearers, they present themselves to the deceased without a charge. The rings (which constantly ask for "flesh") are recharged by killing living beings and removing their hearts; each heart restores .01 percent power to every ring in the Corps. Black Lanterns are also able to read the emotions of the living as a colored aura that correlates to the emotional spectrum (red for rage, violet for love, etc.). After he had been restored to life, Black Hand is converted to the Indigo Tribe whose power ring allows Black Hand to perceive compassion in others and to force compassion onto those who feel none. Indigo light has the ability to heal individuals with great empathy and to expose people to pain that they have inflicted on other people. Indigo Power Rings can teleport their users and others over intergalactic distances. This ability utilizes a great deal of power from an indigo power ring, and Indigo Tribe members try to use it sparingly. Eventually he loses this ability and starts wearing a black ring again. In the alternate timeline of the "Flashpoint" storyline, William Hand is killed by Atrocitus to unleash Nekron in the process. Black Hand appears in DC Universe Online, voiced by Gray Haddock. Black Hand appears as a playable character in Lego Batman 3: Beyond Gotham, voiced by Liam O'Brien. ^ Rozakis, Bob. "Alter Egos And Alternate Earths" Archived 2011-08-10 at the Wayback Machine, Comics Bulletin, accessed February 3, 2011. ^ Cronin, Brian. "Comic Book Legends Revealed #298", Comic Book Resources, accessed February 3, 2011.